Powers/Abilities: Birdie was a unique airplane that flapped its wings and could out fly any other aircraft in the sky. Birdie seemed to have an intelligence of its own and could perform incredible feats without a pilot in the cockpit. History: After the death of his father, the former wartime hero known as Airboy, David Nelson III discovered his father's old plane, Birdie, in storage. Restoring it to working order, he donned his father's old costume, and became the new Airboy. Comments: The original Airboy was the creation of Charles Biro and Fred Kida. Having acquired the rights to Hillman's properties, in the mid-1980s Eclipse Comics launched a new Airboy series, which ran for 50 issues. 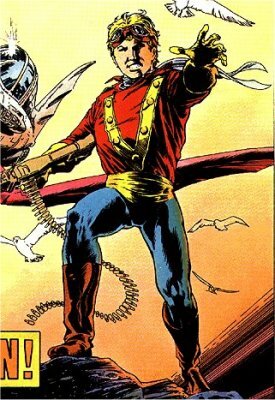 The rights to many of the Eclipse characters were bought by Todd McFarlane, but though he can use their version of Airboy, it seems the earlier, Hillman version, is now public domain, and as a result Moonstone Publishing recently began producing new stories too.